Micronesia, an area in the southwest Pacific Ocean containing thousands of islands, has no single mythology. The various islands and island groups—including the Caroline Islands, Marshall Islands, Mariana Islands, and Gilbert Islands—each have their own collection of legends and mythological beings. 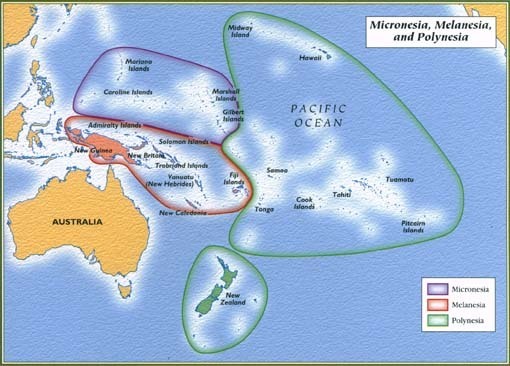 Micronesia is part of a vast region known as Oceania. Europeans arrived in Micronesia in the 1520s and brought Christianity with them. As the new religion became established in many areas, traditional beliefs declined. In addition, the contact with European cultures led to changes in local myths and legends. Travelers and missionaries wrote down some of the original myths, but many were lost before they could be recorded. Although the myths and legends have changed over the years, reflecting developments in Micronesia, they remain an important part of the region's cultural heritage. Religion and Myth. Before the arrival of Europeans, the peoples of Micronesia practiced a variety of forms of polytheism, a belief in more than one deity. These polytheistic religions resembled one another, but the gods and myths differed from island to island. The Micronesian religions also included ancestral spirits (called Ani in the Caroline Islands) and numerous other spirits that performed specific functions and were associated with particular locations. Only certain people, such as priests, healers, and magicians, could communicate with these spirits. They usually did so through dreams and trances. courage in battle, and skill in navigation. To ensure the goodwill of the spirits, people often entertained them by dancing and singing. In return, the spirits provided information about the cause of individual misfortunes and prescribed cures and magical spells. Myths were often used to teach members of a group about particular beliefs or skills. Myths about Aluluei, a god of seafaring, included information useful for training navigators. In addition, legends told in the Marshall Islands dealt with forecasting weather and determining position at sea by observing natural phenomena. The Micronesians also had myths that expressed their beliefs about the earth and sky, the afterlife, and the roles of gods and culture heroes. The myths were passed from one generation to the next by professional storytellers. Major Gods and Characters. Micronesian myths featured creator gods, demigods, tricksters, heroes, and ancestral spirits. Creation stories generally dealt with the origin of particular islands or groups of people. For this reason, there were numerous creation myths and a variety of creator deities. Nareau, the Spider Lord, of the Gilbert Islands, was one of the best-known creator gods. After emerging from a primeval place— consisting of darkness, endless space, or the sea—he created heaven and earth and two beings, Na Atibu and Nei Teukez. From these beings sprang many gods. One also called Nareau and known as Young Spider played an important part in separating the earth from the sky and in creating the stars, islands, trees, and creatures of the earth. Another creator deity was Loa, the supreme being of the Marshall Islands. From his leg emerged Wulleb and Limdunanij, the first man and woman. Perhaps the most important trickster and culture hero in Micronesian mythology was Olifat (also called Olofat, Olofath, and Orofat). The son of the god Lugeilan and of a human woman, the mischievous Olifat was a contradictory figure torn between two worlds. He sometimes rose to heaven on a column of smoke and other times descended to earth on a bolt of lightning. He was often associated with fire. While in heaven, Olifat disturbed the gods by singing and making other noises. On earth, he played tricks on humans. Some tricks had unforeseen consequences, such as giving sharks sharp teeth and putting stingers on the tails of scorpions. The Micronesians linked particular deities, spirits, and heroes with certain functions and skills. Aluluei, the god of seafaring, had numerous eyes that became the stars of the night sky used by sailors to navigate at sea. Bue, a culture hero of the Gilbert Islands, taught Micronesians how to sing and dance, build canoes and houses, and raise winds by magic. Naniumlap, the fertility god of the Caroline Islands, helped ensure that plants and animals grew and that women had children. Finally, Nei Tituaabine, the tree goddess of the Gilbert Islands, made sure that trees grew and bore fruit. Major Themes and Myths. Despite the great variety of myths that existed on Micronesia's many islands, certain themes could be found throughout the region. Origin myths typically dealt with the creation of the earth and sky, gods, islands, heroes, features of the landscape, humans, and other creatures. A common theme in eastern Micronesia was the use of a creator god's body to form the earth, sky, sun, moon, and other features. In the Gilbert Islands, the work of creation was shared by the Spider Lord, Nareau, and the younger Nareau (Young Spider). The main event in many creation myths was the separation of the earth from the sky. Stories about the older Nareau, for example, told how he ordered Sand and Water to mate. Two of their offspring then produced many beings, including Riiki, the eel. Riiki pushed up the sky, and Nareau created the sun, moon, stars, rocks, and a great tree. The ancestors of humans sprang from the branches of this ancestral tree. Myths about travels between the sky and the earth were also quite common. Stories about the trickster Olifat often described his journeys up to heaven and his descents to earth. In addition, a mythical child named Thilefial traveled to the sky to escape mistreatment on earth and then returned to earth to take revenge. One of Micronesia's mythological heroes was Motikitik, famous for his fishing feats. According to one myth, Motikitik was curious to know how his mother always managed to provide large quantities of food, so he stayed at home and spied on her. He heard his mother say a magic spell and watched her dive into the sea. Changing himself into a diving bird, Motikitik followed her and saw her gathering food. By discovering her secret, however, he caused her to die. During the next three days, Motikitik fished up many baskets of food. On the fourth day, he fished up an island, where he went to live with his two brothers. Micronesians worshiped ancestral spirits that were associated with particular purposes and places. Priests and healers communicated with these beings through dreams and trances. 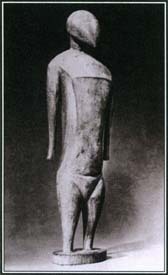 This wooden figure comes from the Caroline Islands. afterlife. According to one myth, when gods first created humans, men and women lived separately under two different trees. The guardian spirit Na Kaa warned them not to leave their particular trees, but once during his absence, the men and women gathered under the same tree. When Na Kaa returned, he told them that they had chosen the Tree of Death. This was how humans became mortal. When humans died, their souls journeyed either to a paradise (underwater or in the sky) or to a gloomy underworld realm whose gates were guarded by evil spirits. The adventures of tricksters were a common feature in Micronesian myths. The trickster Olifat annoyed the gods, made fools of men, and sometimes caused human injury or death. Many stories about him tell how he changed his form to a bird, an animal, or an object to escape detection or punishment. Despite his often harmful behavior, Olifat sometimes helped humans who sought his advice about love and other personal matters. He is also credited with introducing the art of tattooing to the people of Micronesia. Many Micronesian myths featured animal tricksters. The stories usually revolved around three main characters, such as a rat, a crab, and either a turtle or an octopus, and recounted the pranks they played on other creatures. The myths also helped explain the relationships among various animals. Some evil characters in Micronesian myths were cannibal spirits or ogres. Usually characterized by their strength and stupidity, these creatures could be frightened away by loud noises and were terrified of fire. A well-known mythological hero was the ogre-killing child who sometimes saved entire villages by destroying the evil creatures. Tales about Pälülop, a great canoe captain, and members of his family were popular in the Caroline Islands. The stories were complex, included a bewildering array of characters, and dealt with many different subjects. One story told how Pälülop's sons Big Rong and Little Rong became jealous of their younger brother Aluluei and killed him. Pälülop brought Aluluei back in spirit form and gave him lots of eyes that shone like stars to help the boy protect himself. Another well-known myth involved a porpoise girl, a mermaid-like creature who came to land either to steal something or to watch people dance. While she was on land, a man hid her tail, which prevented her from returning to the sea. The porpoise girl married the man and had children. Many years later she found her tail and returned to the sea after telling her children never to eat porpoise. Stories of this type, in which people learn not to eat certain foods, were often used to explain the origin of certain food taboos. In some versions of the myth, the girl came from the sky, and the man hid her wings. of the Pacific at a very early date. See also Afterlife ; Animals in Mythology ; Creation Stories ; Melanesian Mythology ; Polynesian Mythology . Do you happen to know anything about a story of giants who migrated from "downstream" to Yap and Kosrae by walking "through" the water? These were humans, but very tall.